Fact: Employees are 38 percent more engaged when they believe their company cares about their health and wellbeing. Learn how to align your employee engagement strategy with research-based insights into the benefits that are most meaningful to employees today. 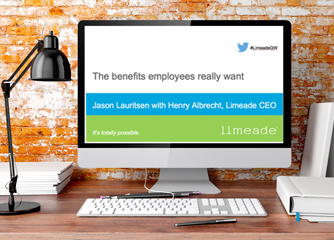 During the webinar, Jason Lauritsen of Quantum Workplace and Henry Albrecht of Limeade will dive into workplace wellbeing research to give you actionable insights you can use for your own employee engagement program.